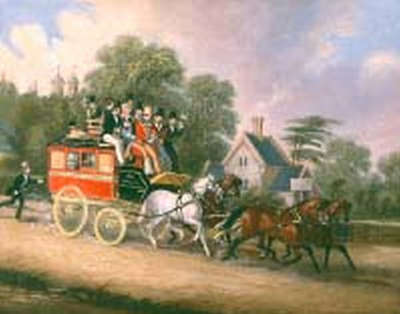 When Barnet was the gateway to the North, back in the 19th century, over 150 coaches would pass through the town every DAY. Here local historian and author Richard Selby takes you on a fictional coach journey to the top of the hill. Rain spiked my face and blurred my vision and neither the brim of my hat nor the high collar of my cloaked coat kept it from running down my neck. I held on to a rail for dear life as the coach lurched and swayed over the rutted track and I took no solace that the other nine passengers perched perilously across the roof were just as miserable. I bruised my back on the sharp corners of a trunk or one of the cases which shared the spine of the coach and I had to steady myself by locking my feet under other luggage which had been strapped to its sides. 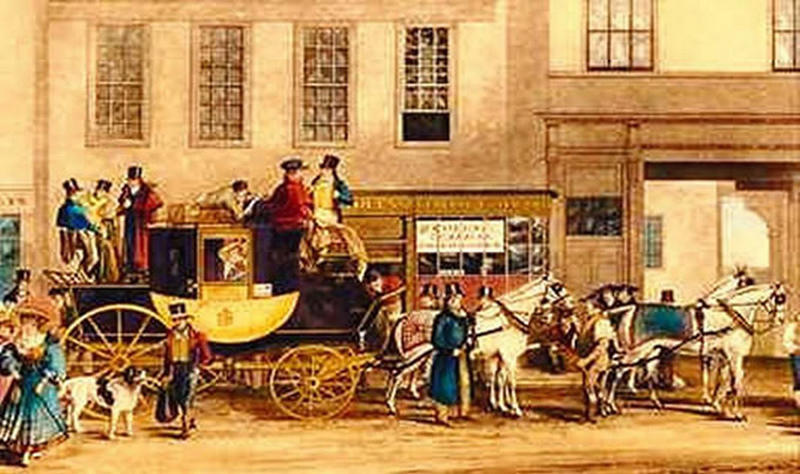 The coach was dreadfully overladen and perilously top heavy. My shoes had been soaked in soggy mud and I shivered in the dampness. The journey had been tiring, although we had been gone from Holborn for only two hours. An average of about five miles an hour was to be expected in those conditions and at least I was not walking to Barnet. Some of the road users stepped aside into the bushes to avoid the mud which splashed around the horses' hoofs and from the great wheels. I looked past the driver and saw steam rise from the labouring animals. Their backs were a lustre of sweat and rain and their odour filled the air. We had not stopped at Whetstone for the gate had been opened when the keeper heard us coming. Our guard had sounded his distinctive tarantara when three furlongs distant which gave the gatekeeper at least two minutes to don his cloak. All of us apprentices recognised the particular calls of the coaches. The Mail Coaches horned authoritative fanfares for they had a time schedule to uphold. Woe betides their drivers who let a precious minute be lost. We were only riding on a stage coach which would get to its destination when it could. Water lay in dark pools and puddles for despite the road having been metalled with block some years previously ruts had been worn through the surface and were full of sludge. We never knew just how deep they were until the wheels sank to their axles. However, the coachman deliberately drove us through the well-worn tracks, for to miss a furrow would have meant that the coach would ride up on one side and probably upturn us. There were ladies trying to retain some modicum of modesty and bearing beside me. They, likewise, had chosen to pay half fare for the topside ride. Those who could afford to ride inside, four men that day, were being thrown about a claustrophobic cabin. We considered ourselves lucky that we were the outsiders. Despite the rain there was nothing as exhilarating as that kind of journey. 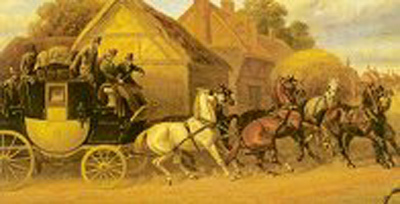 Sometimes the coachman would let me take the reins, and that was a treat with all four horses responding to my left hand. My right held the whip and occasionally I used it to spur the charges ahead. But that day all I could think about was staying in my place. The coach slowed to cross tracks as the bulk of a covered waggon appeared ahead. It too was making for Barnet but its journey was very slow. The waggoner walked beside its train guiding the leaders along the road. As we passed them I counted eight heavy horses linked in pairs struggling to grip the mud. Each step of their way was laboured as they sank to their fetlocks in the mud-filled ruts. They were caked in layers of filth and their burden seemed more than the load they hauled. The wagon probably carried a dozen tonnes and I wondered what it was that it transported. Could it have been building materials or foodstuffs? I let the thought fade as the coach returned to its original tracks with much rocking and noise. The springs holding the carriage above the axles were of leather and steel so they screeched loudly as they stretched to their limits. 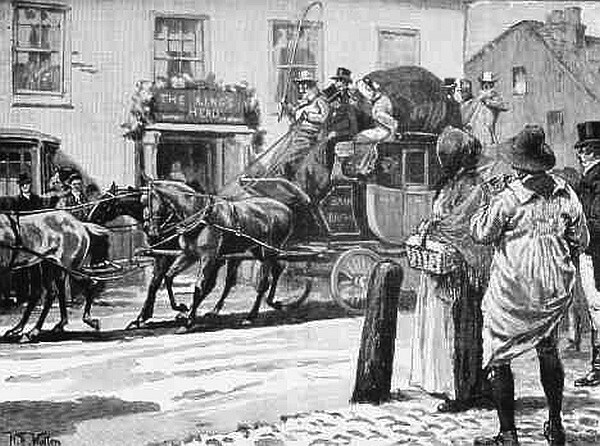 When another coach approached from the other direction we came to a halt and the coachmen exchanged tidings. It was quite four minutes before ours was reminded of his purpose by a shout from within and we continued. Each of us gave greetings to the passengers on the opposite vehicle with much hat touching and waving of hands. They were delighted to hear that Trafalgar had been won as we called the good news across the road. The hamlet was before us but we had first to negotiate the decline of Pricklers Hill. We passed Underhill House and descended again towards the cottages which lay below the next climb into Barnet. It would have been nightfall before we arrived but I held an introduction to a Mrs Scarbody who owned the Queens Head in Hadley. She would find me a bed for the night if I could afford no other, and I was ready for her hospitality. The coach rolled down into the yard of the Lower Red Lion where two of our passengers alighted. I helped to throw down their portmanteaux and other luggage. 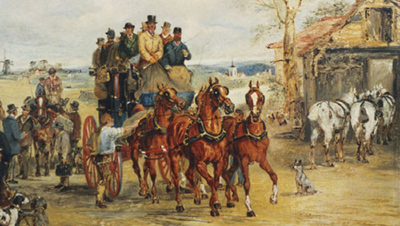 The coachmen checked that an additional team was available and ostlers brought a pair from their stables already harnessed for attaching to our leaders. The guard shouted out a warning to us to hold on and the coach, now with six horses, was led out for the procession to Barnet. The train was led by the ostler from the Red Lion riding astride the front pair and we proceeded at his pace, which in all honesty was not much slower than the journey we had so far endured. On my previous visit no spare teams had been available and the most nimble of the passengers had been made to walk the hill. The incline steepened and the horses strained more than they had in the past ten miles. They had coped well with the climb to Islington and had overcome Highgate Hill without flagging. Their passage through Finchley Common had been a drag and I was full of admiration at this, their final challenge of the day. I wondered just how many teams would need to be linked to the wagon which we had passed fifteen minutes previously. The hill took a few minutes to ascend but the lights of the town lay ahead of us, and I began to anticipate the hot meal and a glass or two of ale. The tower of the church was silhouetted against the last colours of the evening sky which had begun to show through the breaking clouds. Slowly, ever so slowly, our coach approached the houses, cottages and inns. Most of their chimneys exuded smoke which hung in the damp, windless air. The rain had eased but the road remained slippery despite the surface of the hill having been prepared in a proper manner, and plentiful hay had been strewn to soak up the mud and manure. Our way was blocked by a lone cow but the leadsman gave it a kick and it returned down a side alley. The bulk of Middle Row divided the road as it widened. Inns and taverns, alehouses and shops were around us when we reached the brow of the hill and we stopped for the spare horses to be unhitched. “To those who ride with us to Biggleswade,” shouted the coachman, “be in the yard of the Boar’s Head at seven of the clock. That is in one half hour, if you please." I glanced at the clock on the church and wondered if it chimed the hours. Thankfully I was not to be continuing my journey until the morrow. We dismounted and I watched to see where my fellow passengers retired. The gentlemen from within stretched their legs and walked into the Kings Head. Moments later liveried boys ran out to collect their luggage. I nodded farewell to my companions and stepped out on to the High Street as the coach was led through the arch of the Boar’s Head. I looked around to recall my memories for it had been awhile since I had ventured this way on my journeys home to the Midlands and I intended to spend the evening with acquaintances that I had met on an earlier visit. There was a pennant hanging bedraggled from the mast on the church tower. The stones in its graveyard stood worn and ready to fall, and the few that had toppled were already overgrown with the briars of neglect. The town was old and the houses were an assortment of design and purpose. Cooking pots within teased my nose with vapours which escaped through open windows. Alleyways seemed to tunnel themselves between the overhanging timbers of adjacent houses, down which I spied goats tethered amidst sleepy hens in the yards behind. Hearty laughter turned my head to the open door of an ale-house through which I could see the flames of the hearth adding warmth to its patrons’ fellowship. “It is good to be here again,” I remember saying to myself with an air of blissful recollection, and in heady anticipation stepped out towards Hadley. The foregoing account is an imaginary journey to Barnet at the start of the nineteenth century. However it would indeed have been as romantic, for the details are correct as far as records tell us.